Talk about bootilicious, this lady is da bomb. 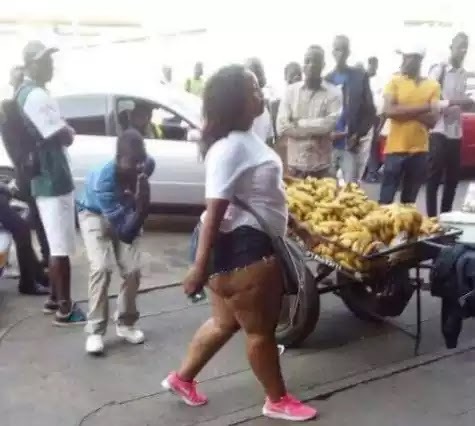 According to iHarare, the woman who happens to be a dancer was captured on camera giving the men a free twerking show, shaking her assets to the enamored men who were cheering, clearly enjoying the show. Her colleague played music from a twin cab truck while she entertained the unruly crowd. But things got out of hand and the buxom woman whose shorts revealed parts of her rear, braved the hostility around her before finding a shop to take shelter in. The more conservative crowd blasted the woman for trying to imitate Western countries’ sense of fashion whilst forgetting that she was Zimbabwean. There were laments of cultural alienation and some threw digs at her sheer size.